Of all the things you expect to see at Pioneer's CES booth, a bicycle probably isn't high on the list. Still, Pioneer's new Cycling Sports brand attracted plenty of attention with a live demo showing off the new Cyclocomputer and Pedaling Monitor. 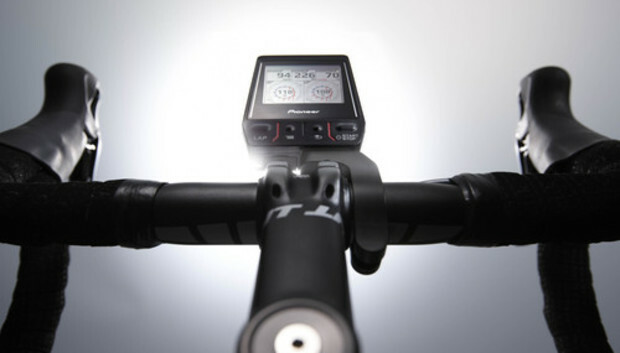 The Cyclocomputer and Pedaling Monitor work together with Pioneer's Web dashboard, the Cyclo-Sphere, to provide cycling enthusiasts with a complete system of metrics and analysis. The system as a whole is noteworthy, but the Pedaling Monitor in particular caught my attention: Pioneer is the first to achieve on-bike, real-time pedaling-power measurements for both legs using 12 different points spaced out on a single 360-degree pedaling stroke. What does that mean? Essentially, this means that the devices can measure metrics throughout an entire pedal stroke--it knows how much force you exert continuously as you pedal, and not just at the beginning of a pedal stroke. Both the Cyclocomputer and the Cyclo-Sphere transmit information on a special ANT+ stream to help users track power output, pedaling stroke efficiency, power loss, force vector, torque, and 195 other kinds of data. That's right, the Cyclocomputer tracks a total of 199 different metrics--heart rate, cadence, speed, distance, GPS positioning, elevation gain or loss, ambient temperature, and (obviously) much, much more. However, it doesn't come cheap: The Cyclocomputer will set you back $900 (I think I may have actually gasped when they told me the price), while the Pedaling Monitor retails for a whopping $1600 meaning the total price of the hardware is enough to purchase a (crappy) used car. It is truly an enthusiast product. And the incredibly detailed metrics both on the Cyclocomputer and within the Cyclo-Sphere dashboard definitely make these high-performance products that provide enough data to make a team of scientists happy--and hopefully more than a few cyclists.